The Chiefs will enjoy a week off in the Super Rugby play-offs, and will play their semi-final at home in Hamilton, after surviving a determined challenge from the Blues in round 20 at Eden Park in Auckland. The Chiefs were assured top spot in the New Zealand conference when the Crusaders failed to claim a bonus-point victory against the Hurricanes on Friday night, and they must have felt confident of the top-two berth and all the advantages that it confers when Blues backrower Kane Barrett was sent off in the 22nd minute, nine minutes after Bundee Aki had scored the first try of the game. But the Blues refused to lay down, even when Baden Kerr was sin-binned for a deliberate knock-on that ended a Chiefs breakaway shortly after half-time, and they sent off departing captain Ali Williams, Anthony Boric and All Blacks star Rene Ranger with a spirited display that pressured the Chiefs throughout. The hosts claimed a two-point lead late in the first half, and they went to the break level at 13-13, but the Chiefs eventually pulled away on the back of a brace of tries from prop Ben Tameifuna. Chiefs coach Dave Rennie now has plenty to ponder ahead of the semi-finals as the defending champions were less than convincing against the Blues, despite possessing a huge personnel advantage, a week after their poor showing against the Crusaders. All Blacks first-five Aaron Cruden certainly will want to make a statement during the play-offs after missing all four of his conversion attempts. Blues coach Sir John Kirwan and his squad of youngsters, meanwhile, will set their sights on 2014 after a season of lessons for players and coaches alike. Came here supporting the Chiefs and leaving respecting the heart of this Blues team!! #wontmentionrefs!! #Goodthingsahead. 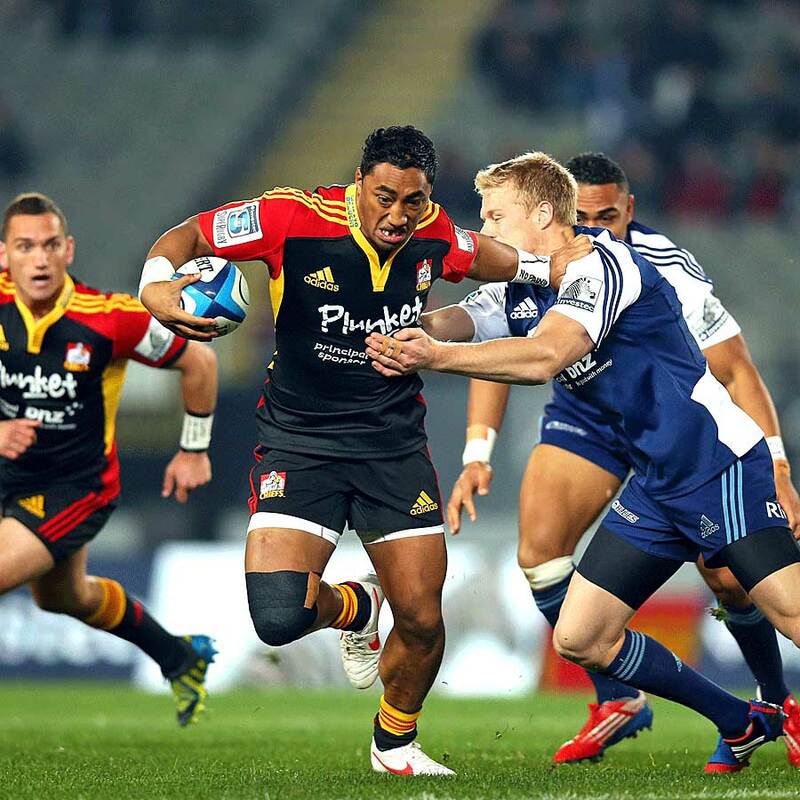 Kerr kicked a penalty to open the scoring before Cruden levelled the ledger and then the Chiefs exploited space for Bundee Aki to score after Blues debutant winger Lolagi Visinia had darted out of the defensive line to stop an attack,. The Chiefs lost Matt Vant Leven to concussion, replaced by Sam Cane, but they were then gifted a one-man advantage when Barrett was sent off after apparently stamping on the head of Craig Clarke. The Blues, their backs against the wall, hit back with a try from Charles Piutau, but they could not hold on to the ensuing two-point lead as Hika Elliot pushed the Chiefs ahead when he scored six minutes before the break. Kerr slotted a penalty with time winding down to ensure the sides headed into the break tied at 13-13. The Blues looking to counter their one-man disadvantage with a territory-focused game, and they regained the lead when Kerr landed a penalty three minutes into the second half. The Counties Manukau pivot then was sin-binned for intentionally batting the ball into touch as Liam Messam looked to finish a lengthy break with a pass to supporting player. The Chiefs finally took advantage from their mounting pressure as Tameifuna twisted his way through a pile of bodies to score his first try of the night to claim an 18-16 advantage. The impressive prop soon after used his 130kg size to punish the Blues once again, and the Chiefs were on their way to a week off. Rennie and Kirwan agreed the red card shown by referee Craig Pollock to Barrett had been the turning point of the match, the Chiefs coach labelling the decision "harsh" while his Blues counterpart was more critical even if he chose his words carefully after his assistant Sir Graham Henry landed in hot water with SANZAR two months ago for slamming match officials. Chris Pollock has just sent Kane Barrett off for a reckless (but probably accidental) stamp to the head. Penny for James Horwill's thoughts. Kirwan suggested SANZAR referees boss Lyndon Bray should adopt the system in rugby league, whereby a referee can be suspended for poor performance. "I just challenge Lyndon Bray to start doing what we do - being dropped from selection next week because we didn't play well or losing your job because you can't coach well," Kirwan said. "All I'm saying is please take a leaf out of the book of the NRL so we can at least challenge this stuff." Clarke, whose head was ruled to be in danger from Barrett's right boot was bewildered by the decision. "My shoulder," Clarke replied when asked to confirm whether his head had been struck by his Taranaki team-mate. "I just felt a little bit on my shoulder "Personally I feel a little bit for the man. I guess if that was a club game in Taranaki you wouldn't look twice at that sort of thing."